YOUR VERY OWN VIRTUAL HOBBY SHOP! 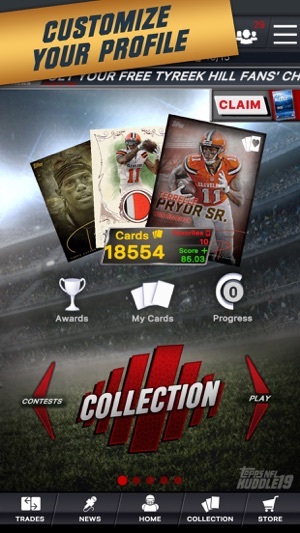 •Classic Topps meets the Digital Age: Relive the nostalgia of football card collecting and trading all from your mobile device! •NEW cards releases every day! Collect your favorite NFL superstars, both past and present! •Dynamic consumer products: HUDDLE base cards, original artwork, classic Topps sets, live player signature cards, and more! BRING YOUR CARD COLLECTION TO LIFE! • Watch LIVE NFL games and compete in real-time Contests against fans from around the world! 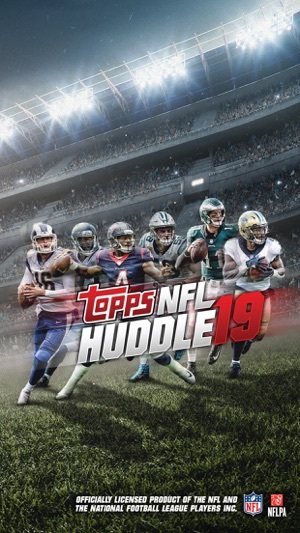 • Enter FREE contests and set your ultimate lineup with your best HUDDLE® player cards to win points, awards, prizes and more! 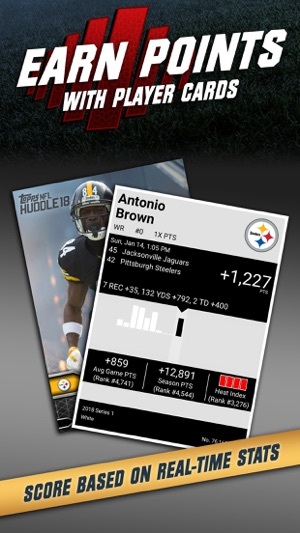 • Player cards reflect real-time NFL action – they score…you score! • Chase cards that have BOOSTS to super-charge your collection and Contest lineups! 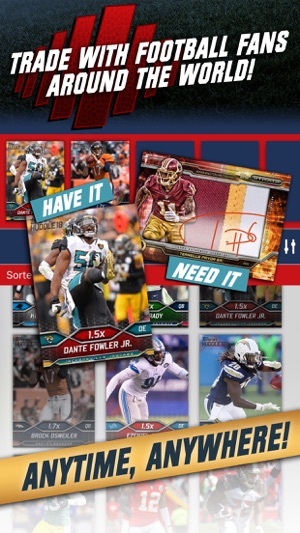 • FIRST-EVER “Flow of the Game” scoring feature: Swap cards in your lineup and feel the excitement of every touchdown, field goal, tackle, sack, and more! BECOME PART OF HUDDLE NATION! • Topps has the best community of football card collectors in the world. 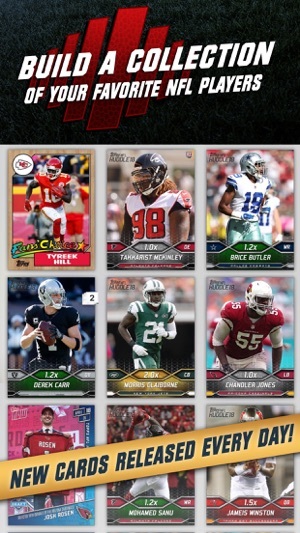 • Chat with fellow football fanatics in our Fan Feed and propose trades with up to 18 cards! • Level up and earn experience points (XPs). You can level up by winning contests, completing sets, and pulling cards from packs. 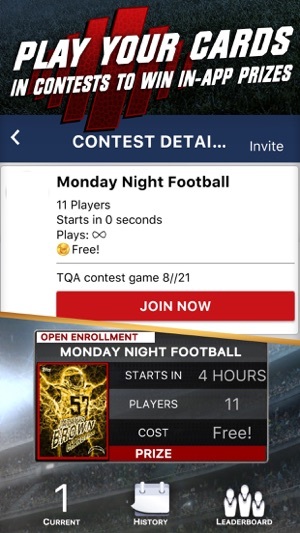 Topps has always had me intrigued with their pack opening app for collecting cards and using them on a team but there are always some bugs like for example the constant “In-App purchases” Notification pop up. It’s not something that ruins the app but it can be irritating. I really think topps needs to add a feature where you can take a picture of cards that you have in real life and have it transformed into a digital copy for your account. Now I understand that would take a ver long time since there are so many topps cards out there, but it is just a neat suggestion. Also, I would LOVE to see a topps basketball app. I’ve been waiting and waiting and looking and researching and hoping that maybe topps would release a basketball version of the game. The only game I have seen is Panini Dunk and that game is too confusing and complicated for me. If topps is able to to these things in the next few years, they’ll have some banging apps. I love all of the Topps card apps and have several that I use daily. One thing that concerns me is how much more attention Bunt gets then any other app. 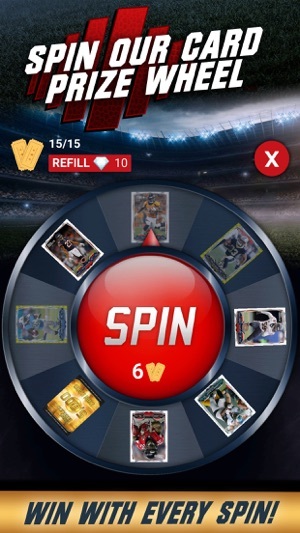 Bunt has a prize wheel, batter up game, and card fusion for your duplicates in the play section. No other Topps app has all three of these extra game modes and it is very troubling. These extra game modes make me visit the app more consistently throughout the day to spin the prize wheel and get extra coins from batter up. They have tried to implement this in Kick and Huddle but they are a poor rendition of Bunt’s rewards. In Kick the prize wheel only gives you base cards from MLS and no special or unique inserts like Bunt. 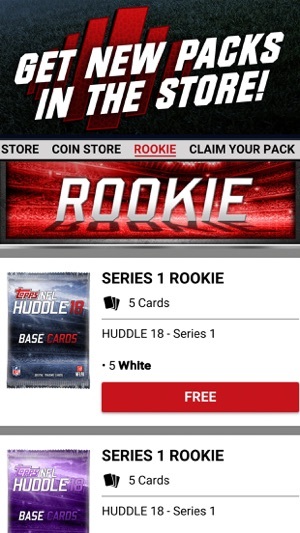 Huddle is similar in that it only offers base cards from the prize wheel, nothing special. Meanwhile Skate seems to be all but forgotten and since there is no incentive to visit the app I only open it once a day to get daily rewards, which is the only way to make coins. Like I said earlier, please make all Topps apps have a standard for gameplay instead of favoring one over the other. There are definitely very easy ways to implement the same game modes across all apps, it just needs a little creativity. One of the best of Topps. One of the best run of the Topps apps. I like the sets and reward cards for getting the set. I also like that they have premium ($$) content, but do not lock all the good cards behind this only. They provide a good balance of collectibility for all while making money with some premium collections. My suggestion for Topps would be to create a $ secondary market. Right now Facebook groups and eBay are selling these cards. If Topps had their own secondary market they could take 10% of all transactions. That would be a revenue stream for Topps and provide users a secure way to buy from others without scamming concerns. © 2018, The Topps Company, Inc.